One of the purposes of RVs is to travel in comfort to beautiful areas and enjoy all the surroundings have to offer, without robbing the bank. But you can’t take full advantage of your time away if you are tired from sleeping on an inferior quality RV mattress. Unfortunately, an RV bunk bed mattress may be less than ideal, but you can make the most out of it! Keep reading. An RV bunk mattress is unique in many ways. First, RV bunk bed mattresses are not a standard size, so it’s near to impossible to run out and buy any mattress and simply put it on the bunk. In addition, the more traditional mattress choices won’t work for RV use. The ideal mattress height for RV bunks is 5”. Much more and you risk hitting your head when you sit up. Innerspring mattresses are often anywhere from eight to sixteen inches high. With their stiff construction, they often will not fit through RV doors either. Some innerspring mattresses may claim to fit RV bunk beds, but that is because they have reduced the height of their coils to fit the space. This means there isn’t a lot of spring to support you, and as those short coils compress, you will probably feel all kinds of lumps and bumps from the mattress construction. Memory foam mattresses have received a lot of attention lately. Memory foam mattresses are constructed by adhering a layer of memory foam to a firmer support mattress. Usually, the memory foam layer is about 2” thick (or it should be in order for you to enjoy that plush feeling). If that’s the case, it means at most you can only have a 3” support mattress. Chances are the mattress will compress as you sleep and you will start feeling every slat of the bunk bed, especially if the supporting layer is poor quality. Some have tried to compensate for poor RV bunk bed mattresses with padded mattress covers, but once again this increases the height of the mattress and risks injury. Latex mattresses may be one option, but they tend to be pricey. So what’s the perfect solution for an RV bunk mattress? Thick, comfortable, durable, high-density foam. Foam is flexible enough to be manageable within the RV, strong enough to support your body, and comfortable enough to offer a great night’s sleep. Also, if you need an odd size RV bunk bed mattress, they are easily customizable. 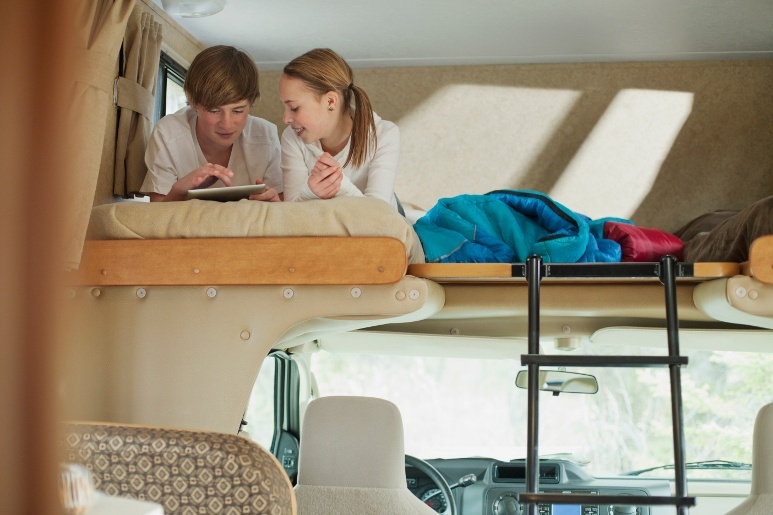 Foam RV bunk bed mattresses offer an affordable way to ensure a great rest during your trip. A foam mattress’ comfort level is created by its density and its firmness. Density is how heavy the mattress actually is. Foam mattresses should weigh around 1.8 pounds per square foot, in order to be both comfortable and durable. Firmness determines how well the mattress will support you. Foam mattresses are measured with a unit called IFD, Indentation Force Deflection. Firm foams range from 40-50 while medium range between 20-30. A high-density foam has more material per square foot and the IFD helps prevent you from ‘hitting bottom.’ If you’re interested in additional information in this direction, we covered everything you need to know about foam here. Because RV bunk beds have unique specifications, it is important to get correctly fitted mattresses that offer maximum comfort and longevity. Foam mattresses are the best possible choice. This entry was posted in RV Lifestyle and tagged Buy RV mattress. I have over 40 years of experience in the mattress industry. At age 12, I began sewing box spring covers in my father’s factory. That was the beginning of a career centered on helping people to sleep well. I’m currently the owner of Walt’s Sleep Shop located in Middletown, NJ, the brick-and-mortar retail affiliate of replacement-mattress.com. My experience in the bedding and furniture industry encompasses manufacturing, materials planning, merchandising, retail sales, and sales management. For the last 15 years, I’ve been a member of the Mattress Committee of Furniture First, a nationwide buying group with more than 200 members and 400 stores covering 47 US States. Awesome blog, thanks for the useful information.